Home Altruism Are there right answers in ethics? Are there right answers in ethics? Ethics education is blossoming in business schools (see a Financial Post article). Yet, the scandals don’t seem to go away: corruption at Canadian construction engineering firm SNC-Lavalin, government interference in mortgage finance and banking (that led to the 2008 financial crisis), new pyramid investment schemes, garment manufacturers whose shoddily constructed factories collapse, killing workers. While ethics education cannot make anybody ethical—it is a choice each individual must make–instead of helping prevent ethics scandals, it may be partially to blame. Studies have shown that business students who take ethics courses are likely to act less ethically, not more. Mr. Crane’s comment reflects the way a typical business ethics course is taught. A moral dilemma is identified, such as: is it ethical to offshore manufacturing/call centers/software programming to a low-labor-cost country? Then various moral theories, typically utilitarianism, Kantian duty-ethics, egalitarianism, and virtue ethics, are applied to the dilemma. This is often supplemented with “stakeholder” analysis: assessing the impact of the alternative solutions to the dilemma on each “stakeholder”—“anyone who can affect or be affected by what you are doing”— and then following the utilitarian logic and choosing the alternative that benefits the most “stakeholders” and harms the least number of them. But such analysis is a waste of time because it does not fulfill the purpose of ethics: providing guidance for achieving values. Ethics can provide right answers to business decision makers—but it must be the right ethics, i.e., a moral code that is consistent with business success: long-term profit maximization. The problem with most business ethics courses today is that the moral theories they cover are not consistent with that standard. The theories taught rest on the same premise: business must sacrifice at least some of its profits for the sake of others, such as the various “stakeholders”. The objectively unanswerable question, to which the various moral theories give contradictory answers, is: how much of profits to sacrifice, how, and to whom? Contrary to most teaching of business ethics, I argue that there are right answers in ethics—because there is an ethical theory that offers guidance consistent with long-term profit maximization in business. That theory is rational egoism, a moral code first identified by Aristotle and developed by Ayn Rand. Like conventional business ethics courses, my classes and book also cover alternative ethical theories. But I focus only on the main moral codes: altruism, cynical exploitation, and rational egoism, and show their premises and implications. 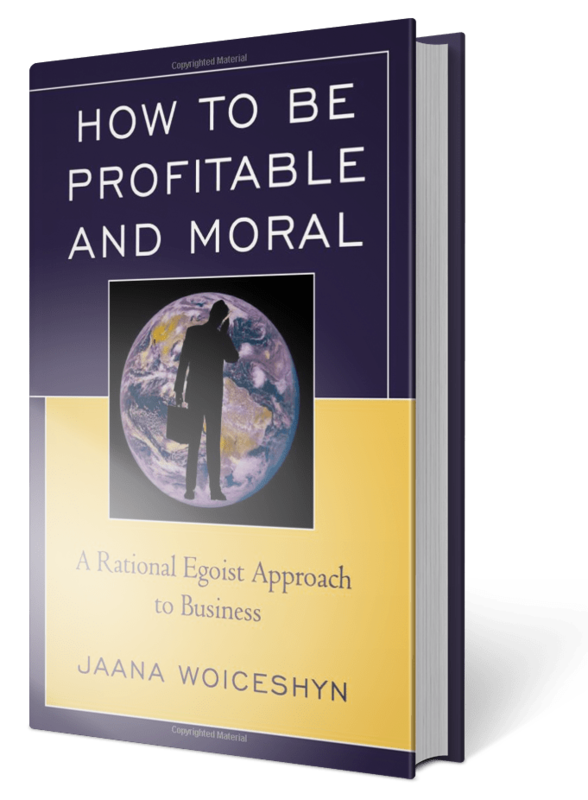 They offer conflicting answers to moral dilemmas, but students can see that only egoism is consistent with long-term profit maximization and therefore offers the right answers to business decision makers. Rational egoism consists of clear moral principles, such as rationality, productiveness, justice, honesty, and pride that have been induced from actual requirements of human survival and flourishing. Such principles facilitate effective moral decision-making, without the need to compare and contrast contradictory moral theories that do not give any clear answers at the end. The added bonus of consulting rational egoism for answers to business ethics dilemmas is that the laborious and ultimately futile “stakeholder” analysis can be avoided. Egoism is based on rational self-interest (no sacrifice for profits is required) which includes respect for the individual rights of others. This means that all interactions a business has with “stakeholders” are based on voluntary trade, with no violation of anyone’s rights. There are right answers in ethics—those enhancing human survival, flourishing, and long-term profitability. They are provided by rational egoism. Previous articleWhy are businesses not gearing up for the post-carbon economy?